Coming soon - new manufactured homes in Big Flats, NY available for outright sale. These homes will each have 4 bedrooms, 2 bathrooms, laundry room, and an island kitchen. 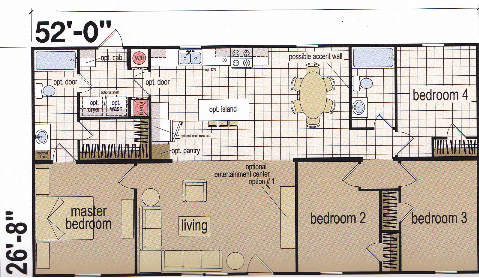 The furniture in the floorplan is *not* included - it's just there to help you visualize your new home! These will be all-electric homes on "HUD" compliant settings (meaning they are eligible for many lenders' conventional mortgage financing).